Judith Godwin, Epic, 1959. Oil paint on canvas (diptych), 82 x 100 in. National Museum of Women in the Arts, Washington, DC. Gift of Caroline Rose Hunt. Photograph by Lee Stalsworth. 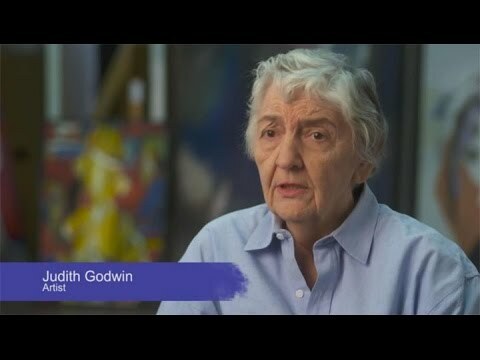 © Judith Godwin. Perle Fine, Summer I, 1958-59. Oil paint and collage on canvas, 57 x 70 in. Collection of Craig A. Ponzio. Image courtesy McCormick Gallery, Chicago. © AE Artworks, LLC. The groundbreaking exhibition Women of Abstract Expressionism celebrates the often unknown female artists of this mid-twentieth-century art movement. More than 50 major paintings are on view by artists working on the East and West Coasts during the 1940s and '50s: Mary Abbott, Jay DeFeo, Perle Fine, Helen Frankenthaler, Sonia Gechtoff, Judith Godwin, Grace Hartigan, Elaine de Kooning, Lee Krasner, Joan Mitchell, Deborah Remington, and Ethel Schwabacher. This is the first presentation of works by these artists together at one time. Women of Abstract Expressionism focuses on the expressive freedom of direct gesture and process at the core of abstract expressionism, while revealing inward reverie and painterly expression in these works by individuals responding to particular places, memories, and life experiences. An original video is on view in the exhibition (watch trailer in the slide show at top), and includes accounts about exciting moments in these artists' lives, as well as issues affecting women during this time period. An educational lounge offers a space for visitors to explore the climate of the 1950s through images, ephemera, and music (with a playlist available on Spotify), a glimpse into other aspects of the artists' lives, and a chance to reflect upon and share personal experiences. An illustrated catalog accompanied the exhibition. The exhibition is organized by the Denver Art Museum and curated by Gwen Chanzit, the museum's curator of modern art. After the DAM, the exhibition will travel to the Mint Museum, Charlotte, October 22, 2016–January 22, 2017 and the Palm Springs Art Museum February 18–May 29, 2017. Women of Abstract Expressionism (on view June 12–September 25, 2016) is included in general admission and is free for members. Specially priced tickets for groups of 10 or more are now available, as well as reservations for private gallery rentals and events. Exhibition tours for groups also can be scheduled (offered Tuesday–Friday, 3-week advance reservations required). Women of Abstract Expressionism is organized by the Denver Art Museum. It is generously funded by Merle Chambers; Henry Luce Foundation; National Endowment for the Arts; the Ponzio Family; U.S. Bank; Christie’s; Harmes C. Fishback Foundation Trust; Barbara Bridges; DAM Contemporaries, a support group of the Denver Art Museum; Dedalus Foundation; Bette MacDonald; Joan Mitchell Foundation; Helen Frankenthaler Foundation; Deborah Remington Charitable Trust for the Visual Arts; the donors to the Annual Fund Leadership Campaign; and the citizens who support the Scientific and Cultural Facilities District (SCFD). This exhibition is supported by an indemnity from the Federal Council on the Arts and the Humanities. Promotional support is provided by 5280 Magazine, CBS4, Comcast Spotlight, and The Denver Post. The film, produced in association with Women of Abstract Expressionism, is generously supported by Barbara Bridges and DAM Contemporaries, a support group of the Denver Art Museum.